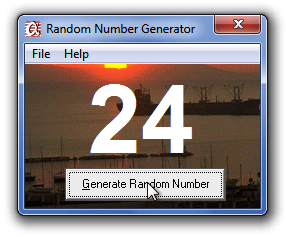 Random Number Generator™ is a 32-bit Windows application capable of generating random numbers. How do I use Random Number Generator™? Selecting the “Generate Random Number” button in Random Number Generator™ will generate a random number. By repeating this simple process, Random Number Generator™ may generate any number of random numbers. Why would I use Random Number Generator™? In scientific, mathematical and engineering disciplines, generating random numbers is often necessary for even trivial tasks. That is where Random Number Generator™ makes a name for itself. By utilizing a second generation Random Number Generator™ engine, this program is capable of generating random numbers at dizzying speeds. Can a range of numbers be specified? Not at this time. This and other features are planned for inclusion in a near-future release. It is this kind of helpful input that will help Random Number Generator™ stand out in an already crowded random number generator market. Why does it seem that sometimes the numbers generated are NOT completely random? Although this is inconsistent and therefore difficult to isolate, we have observed this problem in our own labs. If a pattern to this error can be discovered, we will work around the clock until a fix is nearly ready for release. Check back for updates as often as your schedule will allow. By selecting the “Generate Random Number” button and holding down the “Enter” key random numbers may be generated in rapid succession. By selecting the “Generate Random Number” button and holding down the “ALT” and “G” keys simultaneously, random numbers may be generated in rapid succession. See it in action: View a video demonstration of Random Number Generator!